Leopold Bloom King has been raised in a family shattered—and shadowed—by tragedy. Lonely and adrift, he searches for something to sustain him and finds it among a tightly knit group of outsiders. Surviving marriages happy and troubled, unrequited loves and unspoken longings, hard-won successes and devastating breakdowns, as well as Charleston, South Carolina’s dark legacy of racism and class divisions, these friends will endure until a final test forces them to face something none of them are prepared for. 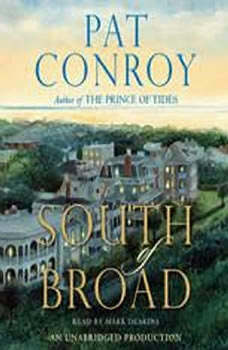 Spanning two turbulent decades, South of Broad is Pat Conroy at his finest: a masterpiece from a great American writer whose passion for life and language knows no bounds. The beginning of this book is great then it gets a little over the top with the main character, and the dialogue becomes stilted and unbelievable, It continues to get worse as the book goes on. I was really disappointed in this book. I was so looking forward to another conroy too. The characters were unbelieveable, and well almost cartoonish. The main character might as well have had angel wings everything was just too much. I wish the editor had done a better job. i very much enjoyed this book.i love the way pat conroy writes his characters.you likely have never met anyone like them but he makes you believe they really do exist.it's a story about survival and also about those who can't overcome their past even with love.